GENEVA, July 11, 2018 — UN agencies, officials and experts tasked with combating racism have failed over the past decade to act or even speak out against global hatred, incitement and violence against Jews, according to a major new report submitted today to Secretary-General Antonio Guterres by UN Watch, the Geneva-based human rights organization that monitors the performance of the world body according to the yardstick of its Charter. 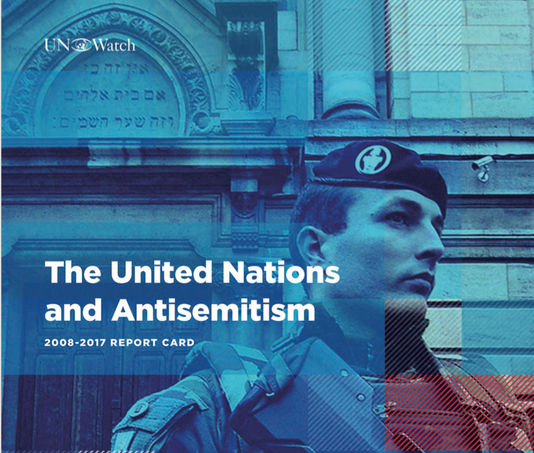 The report's findings are disturbing and clear: key UN agencies, officials and experts are, with few exceptions, turning a blind eye to escalating antisemitism worldwide, from Toulouse to Mumbai. The UN itself recently corroborated UN Watch's findings. Speaking at a Geneva meeting on June 28th, Dr. Ahmed Shaheed, UN Special Rapporteur on Freedom of Religion, acknowledged the “scandalous lack of attention" paid by the UN human rights system to antisemitism. UN Watch today called on Secretary-General Antonio Guterres to acknowledge the world body's chronic failure to address antisemitism, and to set forth an action plan that will mobilize key UN stakeholders, and in particular those within its human rights machinery, to exercise their responsibilities to confront bigotry, hate or violence targeting Jews worldwide. In its letter to the Secretary-General, UN Watch urged the world body to convene a conference to examine how the world body can begin to remedy its neglect of antisemitism. The 40-page report, entitled “The United Nations and Antisemitism: 2008-2017 Report Card,” was presented at the Israeli Knesset this week, at a parliamentary hearing addressed by Minister of Justice Ayelet Shaked, Opposition Leader Isaac Herzog, former Canadian Justice Minister Irwin Cotler and other parliamentarians and experts on antisemitism. With 300 footnotes, the report asks what the UN has done to counter classical antisemitism; it does not focus on the highly pertinent albeit distinct question of whether the UN's singling out and demonization of Israel, the only Jewish state, amounts to the UN itself contributing to antisemitism. • The United Nations has a unique role to play in combating deadly attacks against Jews escalating worldwide over the past decade, from Kansas to Copenhagen, Mumbai to Toulouse. Anti-racism is the defining ideology of the United Nations and its human rights mechanisms. Yet all too often, as documented in this report’s comprehensive examination of the actions of key UN officials, agencies and experts over the past decade, it seems that the UN sees racism everywhere, and antisemitism nowhere. • There are notable exceptions. Secretary-General Antonio Guterres, like his predecessors Ban Ki-moon and Kofi Annan, has made a series of positive statements about combating antisemitism. The General Assembly hosted an informal meeting on antisemitism in 2015. The UN’s Holocaust Outreach Program commemorates and teaches about the Holocaust, reaching broad audiences worldwide. • UNESCO recently released a publication with the OSCE aimed at assisting policymakers in addressing antisemitism through education. Notwithstanding its repeated adoption of one-sided resolutions condemning Israel and downplaying the ancient Jewish heritage of Jerusalem and Hebron, UNESCO also hosted, after an initial postponement, an exhibit on the 3,000-year-old connection of the Jewish people to the Land of Israel. • Regrettably, however, the exceptions prove the rule. Over a decade when Jews were targeted for slaughter in India, France, Belgium, Denmark and elsewhere—whether in a Jewish school, museum, synagogue or supermarket—the UN’s primary agencies and officials for addressing discrimination have, for the most part, turned a blind eye to antisemitism. UN plenaries like the General Assembly and the Human Rights Council, which enact hundreds of resolutions a year, including on subjects related to racial and religious discrimination, failed to address the threat of antisemitism, other than in a few passing words included in general statements. Until 2010, both the General Assembly and the Human Rights Council adopted annual resolutions focused on the “defamation of Islam and Muslims,” mandating special reports, yet there was never one resolution to address anti-Jewish hatred and violence. • During the course of his tenure from 2006 to 2016, Secretary-General Ban Ki-moonissued more than 100 condemnations of terror attacks worldwide. When the attack targeted religious worshippers, mosques or Christian clergy, his condemnations included strong language against the targeting of people for their religious beliefs. By contrast, he refrained from employing similarly strong language regarding terrorist attacks against Jewish targets, many of which he did not condemn at all. In a decade marked by shocking antisemitic violence, Mr. Ban was often silent. While he proved quick to condemn an anti-Muslim film or statement by private parties, he failed to address pervasive, state-sanctioned incitement to antisemitism in the Middle East, including Iran’s Holocaust denial, Jewish conspiracy theories, and calls to commit genocide. • High Commissioner for Human Rights Navi Pillay, who served from 2008 to 2014, was likewise quick to condemn a film perceived as anti-Muslim, as well as “malicious” cartoons by Charlie Hebdo. Yet in the face of murderous physical attacks against Jews, such as the shooting at a Toulouse Jewish school, Pillay was typically silent. Worse, Pillay and her office repeatedly smeared Jewish organizations as “single-issue lobbyists” for seeking to prevent antisemitism from infecting the UN’s 2009 “Durban II” conference on racism. • Current High Commissioner Zeid Ra’ad al-Hussein has not only turned a blind eye to antisemitic incitement and violent attacks—even though he has addressed incitement against Muslims in Myanmar—but he has repeatedly engaged, as have other UN officials, in what Holocaust scholar Deborah Lipstadt has called softcore Holocaust denial, through a series of statements that seek to de-Judaize the Holocaust. • The UN Human Rights Council’s Special Rapporteurs on racism and freedom of religion ought to be the first UN experts to speak out against anti-Jewish discrimination and violence. However, as a rule, successive mandate-holders over the past decade have failed to comment on rising antisemitism, including the murderous incitement against Jews in the Arab and Muslim world, or deadly attacks in Europe and elsewhere. By contrast, they did speak out on behalf of other targeted groups. • Expert bodies like the Human Rights Committee, which review country compliance with international treaties, should be affirmatively monitoring state parties for any antisemitic incitement or violence which puts Jews at risk, or infringes their rights to freely practice the Jewish religion. Yet an examination of the Human Rights Committee’s concluding observations for numerous state parties—including Arab and Muslim states where antisemitic incitement is rampant, as well as other states that have witnessed high levels of antisemitic incidents in the last ten years—reveals that antisemitism is of limited concern. • Likewise, the concluding observations for numerous countries of the Committee on the Elimination of Racial Discrimination (CERD)—including for their reviews of Argentina, Denmark, France, Germany, Greece, Iran, Iraq, Jordan, Kuwait, Lebanon, Morocco, Oman, Qatar, Russia, Sweden, Turkey, the UAE, Ukraine and Venezuela—rarely mentioned violent attacks on Jews or other forms of antisemitism, though they did devote attention to Islamophobia or discrimination against Roma. Moreover, though antisemitic incitement from the Arab and Muslim world has inspired horrific antisemitic attacks worldwide, the CERD addressed hate speech in these countries only when the speech was directed at other groups—but never when the target was Jews.